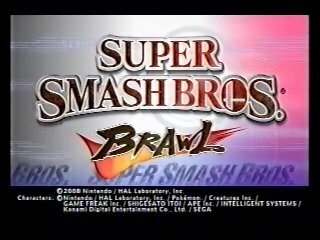 December 3rd, 2007 was a date forever etched into the minds of Nintendo fans everywhere, for it was to be when the Almighty came to Earth in the form of Super Smash Bros. Brawl. But it was not to be, Nintendo announced that Brawl was being delayed until March 9th 2008, increasing the emo population numbers in western countries by 500,000 (give or take 500,000). What prevented a mass suicide is the fact that Brawl features more content than the previous Smash Bros. games combined. The game even includes an epic story mode called Sub Space Emissary featuring all of the characters, who eventually team up to stop a mysterious and powerful enemy named Tabuu. Best boss battles time: easy 0:00:39.25 by Simon 'SW-1988' Wahler on 2008-11-19. Best 10-man brawl time: 0:00:07.43 by Adam 'No1 Inparticular' Young on 2008-11-05. Best 100-man brawl time: 0:01:42.66 by Adam 'No1 Inparticular' Young on 2008-11-27. Best 2-player 100-man brawl time: 0:01:14.68 by Adam 'No1 Inparticular' Young (yes, he controlled both characters) on 2009-05-15. Best All-Star time on Easy difficulty: 0:03:25.61 by Mark 'ChiboSempai' Korsak on 2012-04-29. Boss battles on easy 0:00:39.25 by Simon Wahler. Masterhand - 1.20 - Pretty perfect. Meta Ridley - 4.25 - It's tough to kill him before he flies off the stage for the first time. Luckily, I managed to do so this time. Petey - 3.25 - The second rock smash wasn't perfect, so I quickly had to up smash again. That costed me about 0.3 seconds. Crazy Hand - 1.28 - See Masterhand. Porky - 5.32 - The last rock smash wasn't as nice as it could have been. I lost about 0.2 seconds there. Rayquaza - 9.13 - He's pretty much immune to rock smashes, but there's no other attack that could compete with it, which is why Rayquaza is the longest Boss battle. There is a chance I may have lost 0.2 seconds. Duon - 5.43 - He can be killed with four rock smashes as first or second opponent. Considering he was 7th here, this was pretty optimal. Galleom - 3.47 - Galleom houses the first and only visible mistake I made during the whole run. I didn't max second and third the rock smashes, so I was required to do another one. I lost about 0.5 seconds. Ridley - 3.60 - Luck flows from this run like a fountain of awesomeness. Note: As you proceed, each boss gains more health than your previous foe. You can for example kill Ridley as first opponent with 3 Rock Smashes, while you need at least four as ninth opponent. This is why some of you may think this time can still be improved by alot, but I can guarrentee that this can't go lower than 37 sec! With my description at its end, I leave you with these words. Getting this score was not easy. If you wish to take this spot, you will have to work very hard. I honestly don't think I'll play Charizard for a long time, so the record can be considered up for grabs until I gain the will power to do it again. I am also strongly considering an Intense run with Charizard. We'll start things off thanking all of the SDA crew. You all are great for keeping things running for us. And kudos to Flip for taking over verification, you're a Champ. So this run kind of came out of nowhere. I introduced my 14 year old nephew to speed running a while back and he's been wanting to do a run of his own since. We dabbled a little on some of the games he owns, but nothing really solid came of it. So I finally had the bright idea to do a co-op run of some kind. Enter Smash Bros Brawl. We had to do a game that we were both skilled in and could readily conquer. Petey Piranha - Good to have him early, gave us a couple extra seconds. Porky - Good fight, but faster if he does the stabbing attack. Duon - Awesome. If it does the spin attack, it's over. Galleom - If we get him early, we kill him faster. I got stomped but Christian wasn't grounded and saved the day. Rayquaza - We all know the deal here. 6.5 seconds is good when early, this late in the run, 8 seconds is acceptable. Meta Ridley - This always the hardest fight for us. Not too shabby here. Ridley - At first I thought he was leaving the screen and was going to reset. He stayed and died. We're happy. So what's next? Who knows, but I'm hoping for more co-op fun in the near future. Go Charizard! 10-man brawl 0:00:07.43 by Adam Young. Thanks to Petrie911 for recording the replay for me. I don't really have too much to say here. It's only a 7-second video. It is a bit harder than it looks though. Unlike 10-Man Melee, they don't do the same thing everytime. However, the pattern is always the same. Killing the first alloy on the right makes # 3 + 4 spawn for example. You should be able to get it by watching it. I still don't think this run is perfect though. I'm sure like 7.3x, maybe even 7.2x can be done. I just wanted to submit A 10MB run, because as off this runs existance, no such run has been submitted. I'll probably continue going for the SDA 100MB record. I already beat the one now posted with Pika in 1:47.05, but I know I can do better. 100-man brawl 0:01:42.66 by Adam Young. Petrie911 for recording the video. SW-1988 for just being awesome. Midori for showing Meta Knight's true potential. As of the time I typed this, this is the fastest completion of 100-Man Brawl. The previous record here was 1:47.28 MK by Midori. I beat that not too much later with 1:47.05, and then 1:46.66 Pika. Both of them seem to have the same potential, but Meta Knight is actually easier than I'd though. I usually get an acceptable first 30 about 40% of the time. I'd say maybe 20% for Pika. As usual, I wasn't "really" going for the SDA record. I just tried to beat Midori's time, and had a fail with 1:47.51 which was too close for me too ignore. Then I got this... like 2 hours or so later! ^_^ This time happened to be what I thought was a good time too submit. I didn't really expect to improve by 5 seconds, I was only going to accept anything sub-WR, and just continue on playing without submitting. I'll use this paragraph too explain stuff. You'll notice plenty of pauses in the video around when the clones spawn, and toward the end to make the end of the replay load properly (It's a glitch that just freezes the character O_o) It's because of pause cancelling. Meaning when I played this, and the clones were about to spawn, I kept pausing the game to make the clones come out faster according to the in-game timer. Overall, I'm pretty happy with this one. I wish the replay wasn't so glitched though. Most of my other 100MB replays/vids use the same amount of pause cancelling with no trouble at all =/. I do a couple up smashes instead of up slashes because of crappy lag. When you see this, assume I was trying to jump before it happened, but the game wouldn't accept the jump part(This actually screws me over once). Probably a controller issue. With a perfect run, both Pika and Meta can sub 1:40, but there is too much luck involved with getting everything too work out this well. 2-player 100-man brawl 0:01:14.68 by Adam Young. The only things I need to explain are all the pauses in the video, and how I managed to control 2 characters. The pauses, that are seen around when the clones come out, are when I paused my game during the "real" time I played this. It forces the clones to come out alot faster (about 3-5 seconds per clone) So, for 4 clones, this saves about 12+ seconds, which is big for such a short/fast run. I did the same thing to control both characters. I had 2 classic controllers, both on B-Stick control settings. So, the right analog stick controls the "special" (B-moves) attacks. So, right analog down spam = win. I would either have both Pikas attack at the same time, or have one attack, pause the game with the other controller, unpause with said controller, and attack on the said controller. You should know that Pika's Down B, Thunder, is the best way to cover a side. With 2 Pikas, one on each platform, this covers both sides. Of course, keeping an eye on both characters at the same time can be tricky. This caused some poorly-executed thunders. I could have killed some alloys faster. However, my incredible luck with the 2 bumpers I got make up for this. I actually did get a 3rd one, but it was pointless, so I just ignored it. I'd say sub 1:10 can just barely be reached in co-op. All-Star Easy: 0:03:25.61 by Mark Korsak. This is my second official run submission to Speed Demos Archive. My favorite game to run is Super Mario 64, though I am a competitive Super Smash Bros. Brawl player, so I figured it was only appropriate to attempt a run for this game. I originally tried to complete this run as ROB, who is the character I main in competitive play. ROB still fairs pretty well in Easy All-Star mode, able to kill many characters at 0% with his down Smash, and can follow up off stage and up high well on any botched kills. In the end, ROB wasn't consistent enough in scoring these KOs, as if the CPU opponents ended up controlling their DI a little different (which varies on each playthrough), opponents may live when they would have died in other runs. Taking into consideration how ROB may not be able to kill on certain stages as quick, Jigglypuff in the end was a smarter choice. Jigglypuff has a higher chance of scoring one hit KOs with her throws, and are more versatile, since you can kill off the side as well as off the top. The original record was set quite a while ago, multiple years in fact. I'm glad to have updated it a little bit, though I'm sure it can be improved even further. It can be awkward when dealing with CPU controlled opponents, not to mention getting certain stages over others for various levels, making the run a little more luck based than your normal speed run. Still though, it's a fun run to do that I would like to either see improved, or to improve myself.